A Little About Brandon M.
Brandon M. is an Army Veteran and a midnight Police Officer for our local department. Him and his wife, April, have four children: Chloe, Carlie, Isaiah and Lincoln. His youngest child, Lincoln, is currently recovering from being diagnosed with A.D.E.M (an autoimmune disease marked by a sudden widespread attack of inflammation in the brain and spinal cord). Lincoln is doing a lot better and is in physical therapy. 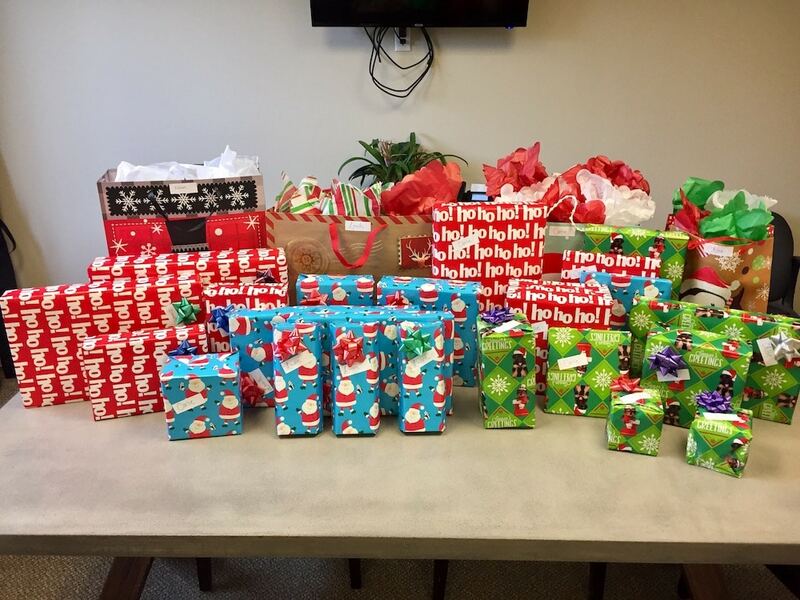 However, because of the many hospital visits, the family could use a little extra help with presents this year. 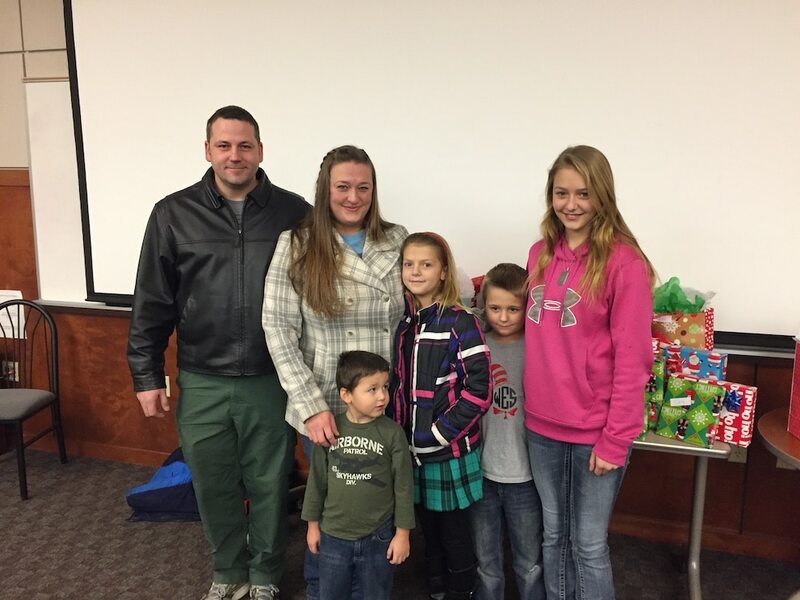 We were very grateful to be able to help this family for Christmas this year. 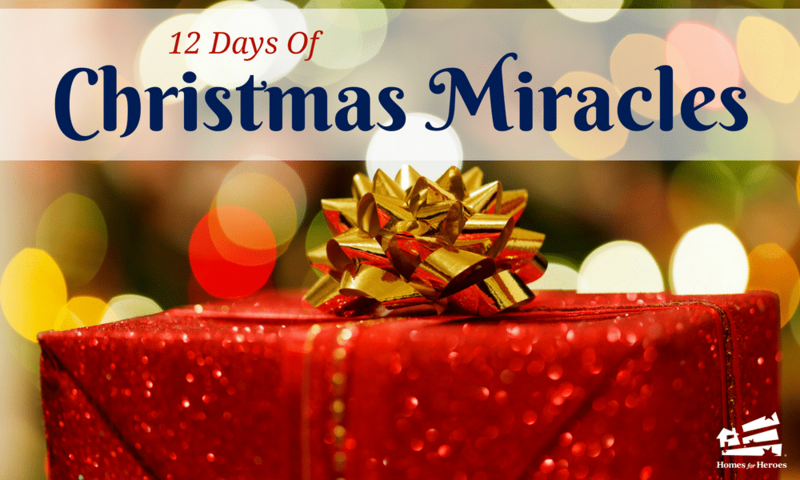 After seeing their children’s excitement, it brought pure joy to our hearts knowing how appreciative the family was for this Christmas surprise. 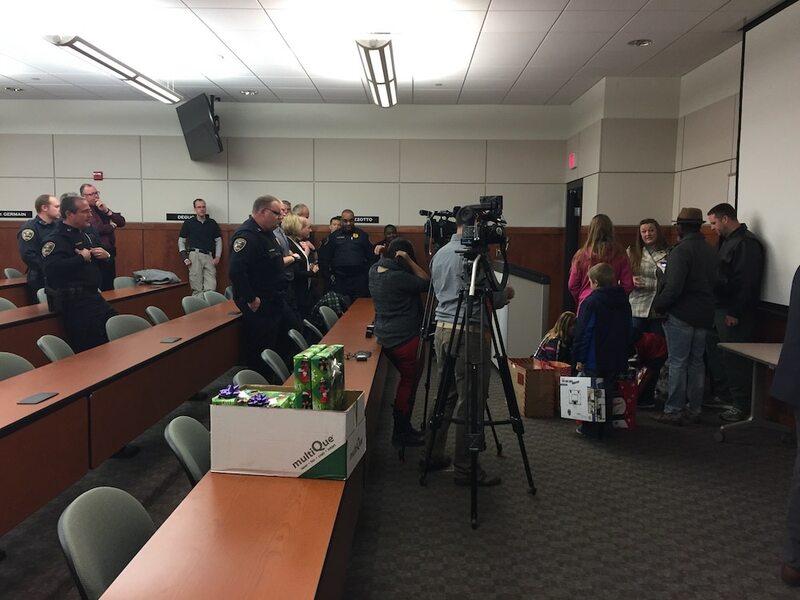 As fellow officers were surrounding the family, our local hero expressed his gratitude for his peers, Homes for Heroes® and the support from the community. It was well deserved. Chloe: A volleyball, harry potter watch and sweatshirt, barnes and noble gift card, itunes gift card, nail polish set, and a scarf. Carlie: A unicorn blanket, several sets of colored pens/pencils with coloring books, a nail decorator set, unicorn socks, and a cheerleading bag with clothing. Isaiah: A football, a soccer ball, Minecraft sweatshirt/t-shirt, Minecraft lego set, regular lego set, a mini basketball hoop for his bedroom door, and a winter hat. Lincoln: A classic train set, a marshmallow shooter, 3 sets of toy cars, a regular lego set, clothing, and a race track for his toy cars. Father (Brandon): a Visa gift card and a complimentary Homes for Heroes sweatshirt. Mother (April): a Visa gift card and a complimentary Homes for Heroes sweatshirt. Hallmark Home Mortgage: $70.00 was given to help purchase presents for the family. Be sure to check out the multiple stories by media outlets in the South Bend area that covered this memorable moment!